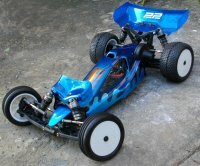 This is the new Bugle Boy Racing body for the Team Losi Racing 22. After trying the original shell I decided I needed to make a shell which provided more ESC room, and better airflow to the ESC and motor when running mid configuration. To achieve this i've pumped out the sides to create side scoops, and made the roof flush leading up to a roof scoop. The side scoops provide motor cooling in mid motor configuration and the roof scoop cools the ESC in both mid and rear configurations. I've also extended the nose out to cover the bulkhead, to provide a little more room for your artwork. Note, the raised side pods at the rear mean that you can't use the original body posts, velcro seems to be the preferred option for most 22 owners.